In response to an email from Hobbytown USA marketing, Ian and Ken from the club were able to attend the Grand Opening celebration for Hobbytown USA in San Jose to represent RCMCC. 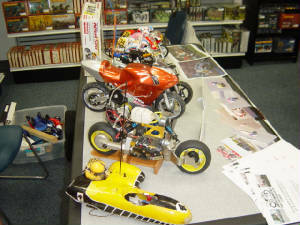 The owner, Brian, graciously had a table setup for us in the back to promote our hobby. 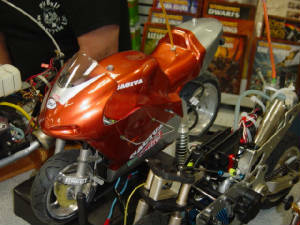 We met many interested R/C personalities, both newbies and veterans, that were amazed by the bikes! Flyers were also handed out. 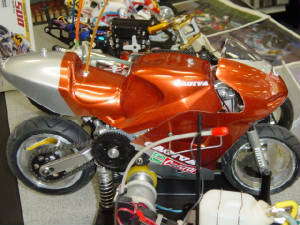 The owner showed his interest as well, motivated by the fact that he himself was an owner of a 1:1 Aprilla. 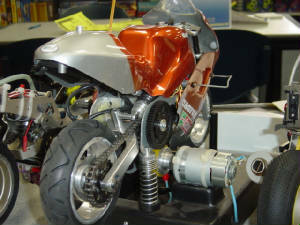 Good news is that Hobbytown San Jose is planning on selling the TT FM-1E, TT Ducati RTR and the newly reintroduced Kyosho HOR bike w/spare parts in the near future. Below are pictures of Ken, Kevin, and Ian’s bikes from the club. 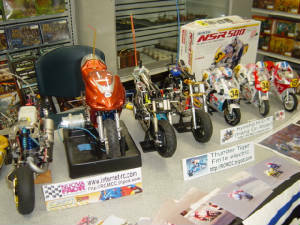 To keep the collection at a good size, we included one of each bike: Kyosho RTR, Kyosho Mark1, Kyosho HOR, almost complete Kyosho nitro HOR (pics were taken but we will keep it top secret for now), TT electric, NF nitro, Bergonzoni nitro w/starter box and front brake kit, Pumillo Tiempo nitro, and just for kicks, a one-wheel-drive sidecar from the UK. 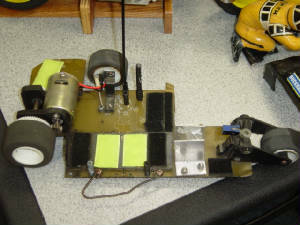 Ken also brought his vintage DWA commando, Kraft Elec Rider, and Royal electric to trace the unique history of R/C bikes.